Holy guacamole! Medical science has just given the green light to avocado aficionados to indulge every day. And the science says we can do it guilt-free because it’s actually good for our health. Had baseline LDL levels in the 25th to 90th percentile (LDL is the “bad” form of cholesterol). Low-fat diet — an abundance of fruits plus low-fat dairy products, whole grains, poultry, and minimal amounts of red meat. Daily fat consumption was 24% of calories consumed. Moderately high-fat diet — Nuts and oils were added to the low-fat diet to bring the daily fat intake to 34% of all calories consumed. Avocado diet — Similar to the moderately high-fat diet but one Hass avocado was added per day and other fats adjusted to maintain a total fat consumption of 34%. One Hass avocado weighs approximately 136 grams (4.8 ounces). Kris-Etherton suggests there may be fiber or bioactive compounds in the avocados that contribute to the avocado’s ability to lower blood cholesterol levels. Further study is needed to pinpoint the exact LDL-lowering mechanisms of the fruit. Avocados are frequently consumed with high-fat foods such as chips, burgers, and mayo-laden sandwiches. 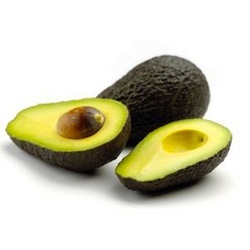 The fats in these accompanying foods will cancel out the LDL-lowering effect of the avocado if total dietary intake of fat is not limited to levels similar to that of the Penn State study. The study was funded by the National Institutes of Health’s National Center for Research Resources and by the Hass Avocado Board. Government funds available for research have declined in recent years. Industry research groups increasingly supplement government funds for research such as this Penn State study. The avocado board played no part in design of the study or interpretation of its results. Kris-Etherton, Penny M., et al. "Effect of a Moderate Fat Diet With and Without Avocados on Lipoprotein Particle Number, Size and Subclasses in Overweight and Obese Adults: A Randomized, Controlled Trial." JAHA / Journal of the American Heart Association 2015 (2015). Web. 15 Jan. 2015. Fresh Avocados: Love One Today. Hass Avocado Board, 2015. Web. 15 Jan. 2015.